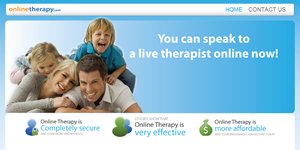 This is a web product for therapists to conduct therapy sessions with clients online. This product will be commercially available to therapists as a subscription service. Accessibility, affordability, and anonymity are barriers to getting needed therapy for many people. This product helps address all 3. Accessibility: Clients who live too far away or cannot drive to their chosen therapist can still get the therapy they need as long as they have a computer with internet access. Affordability: Therapists can often offer online sessions for less because they can fill empty appointments in their calendar or they don’t have to maintain office space. Anonymity: Many people will not seek therapy because of a perceived stigma and they don’t want to risk being seen by someone they know going into a therapist office. Online therapy may help them feel more comfortable because they can still be somewhat anonymous. Instant Availability: Therapists can indicate that they are “Online Now” and users can request an immediate session. Clients can get immediate help and therapists can find new clients and fill available appointment times. Notes: The system keeps notes typed by the therapist during the session. Integrated Whiteboard: Therapists and clients can interact using a 2-way whiteboard during sessions. Document Sharing: Therapists can share documents with clients and preview them with clients during sessions. HIPAA Compliant: The system meets HIPAA requirements for patient privacy.